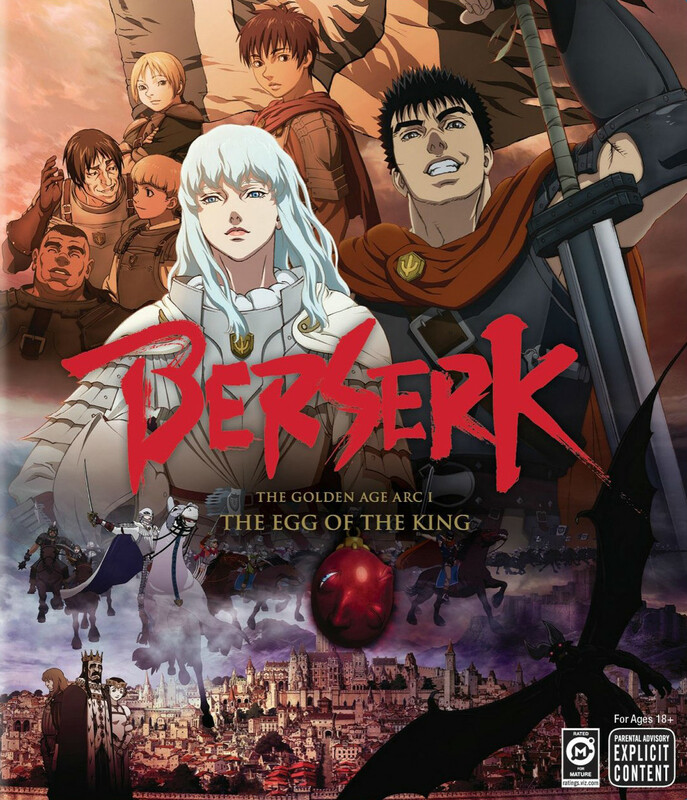 A retelling of the 1990s anime, Berserk: The Golden Age Arc consolidates those events into three films to convey the most well-known narrative involving Guts, Griffith, and Casca. It’s the most obvious jumping off-point for newcomers to the Berserk story, and would seem an appropriate first step in setting the stage for everything else within the Berserk storyline, though, until very recently, no plans to adapt the remaining volumes of the manga were apparent. As is sometimes the case with condensing series into a set of films, the pacing is not the same across the board, which might not be a major point of discussion, were it not for the fact that this element significantly impacts the quality of each of the three entries in the Golden Age Arc. The first film does a solid job of setting the stage and introducing all of the key players. The supporting cast is shown to be a plucky bunch, with a couple of them being young and naïve, and one in particular being a bit more greedy and self-serving, but they all display a great deal of respect towards Griffith, leader of the Band of the Hawk. Due to his legacy having already been established before the first film even begins, Griffith come across as the most well-rounded and interesting character for this first of three chapters. Guts, meanwhile is given just enough development as a strong-willed warrior lacking any real direction in his life to allow viewers to latch on to him as the trilogy’s main hero, though most of his meaningful maturation will follow in the later films. Casca, meanwhile, first appears as something of a snotty spoiled brat, who, like her comrades, is also highly devoted to her comrades, but seems to bear a grudge against Guts from their earliest meeting. A medieval setting is established, as well as how the Band of the Hawk are effectively mercenaries for hire, though tales of their victories have spread far and wide, and many of the trilogy’s villains recognize their record of success. There are mythical fantasy elements at play in Berserk, though these are not met in full force until the final film in the series. When Guts encounters one such beast at the end of the first film, it provides not only a test of his strength, but also offers an omen of events to come. This is the first in a series of key events, where the darkest of settings and most intimidating of encounters offer Guts greater insight into the nature of the world around him. The first film does a solid job of putting all of the pieces in their rightful places, and though it does feel like it wanders from the straight and narrow on a couple of occasions, its pacing is overall appropriate – a far cry from the second film, whose bookends offer the only substantial moments of development for Guts, Casca, and Griffith. Mind you, when these events do come to pass, they are of great importance to the larger tale being woven between these three films. But the hour-long battle they sandwich is neither visually exciting, nor of significant importance to the narrative. The second film does well to take a step back from Griffith a bit, in order to better establish Guts’ ideals and ambitions, as well as prove that there is much more to Casca than meets the eye. This second entry ends on a high note for both of these characters, while still allowing them both plenty of development in the third and final entry, but the absurd span of empty fight scenes not only makes it a dull watch, it also leads the third film to feel rushed. The Golden Age Arc is my first proper viewing of Berserk, though I’ve been familiar with Griffith’s endgame for many years. For those not aware of how the Golden Age Arc concludes, I will warn that some spoilers regarding the film’s most infamous of moments lie ahead. The final film dives into some very dark territory, and sees Guts and Griffith part ways as anything but comrades and friends. For many years, I was under the impression that Griffith’s actions in the third film resulted from some tragic fall from glory, that he lost sight of who he was as a leader and hero to so many. Instead, it is a simple matter of him becoming upset over Guts trying to choose his own path in life, and Griffith not having complete influence over his actions that leads him to perform some horrendous atrocities. The climax for a character who proved so compelling during the previous two films ends up being an unsatisfying reveal of pathetic motivations. And therein lies what is perhaps the greatest downfall of the Golden Age Arc – character motivations on the whole are either incredibly poor, unclear, or wholly nonexistent. Casca is the one major exception to this, offering the most human and believable reasons for joining the Band of the Hawk, for allying with Griffith, and for ultimately turning to Guts as her ally and lover. Guts, meanwhile, sees establishment as the main hero of the Berserk saga by the time the third film comes to its conclusion, but nothing beyond that is achieved. This trilogy feels like the first act of something larger, which may be fine for anyone wishing to carry on with the manga thereafter. There are elements of greatness at play in the Golden Age Arc, but the second and third films constantly deny these to become part of a more cohesive experience. The Golden Age Arc lacks any noteworthy resolution, and leaves viewers with an unsatisfying set of hanging plot threads. Fans of the 1990s anime might not be so greatly bothered by these shortcomings. Guts, Griffith, Casca, and the remaining members of the Band of the Hawk are rendered with strong animation, while environments look equal parts gorgeous and haunting. Cel-shaded 3D models of knights in armor look a tad clunky and dated, but are generally not present outside of battle scenes, so they do not distract from the remaining visual appeal too greatly. 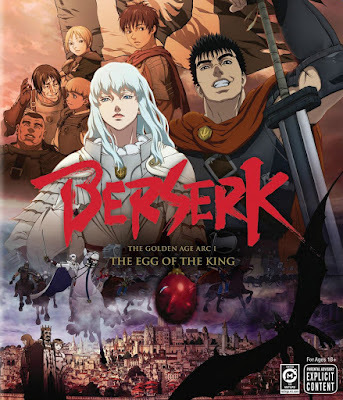 If this trilogy is in fact the jumping off point for someone looking to continue indulging in Berserk by reading the manga, they may find decent value here – the films offer a handful of teases of characters and events that play important roles later on. But as a standalone trilogy, they feel like odd shoehorns. The fact that Guts does not fully come into his own as lead protagonist by the trilogy’s conclusion further sours the experience.